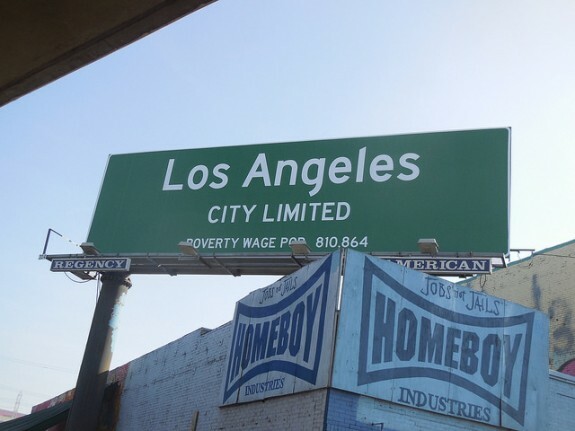 In an effort to highlight the population of Los Angeles workers who earn a ‘poverty’ salary, and to urge Angelenos to support living wage measures, the Los Angeles County Federation of Labor has paid for a month-long campaign of seven billboards that mimic the sign that reminds drivers of a city’s population when leaving or entering its limits. But the figure on these boards is the number of people living on or below the poverty line. Seven towering green objects have recently been erected to adorn L.A.’s skyline, and no, they aren’t palm trees (don’t fret Kevin Roderick). 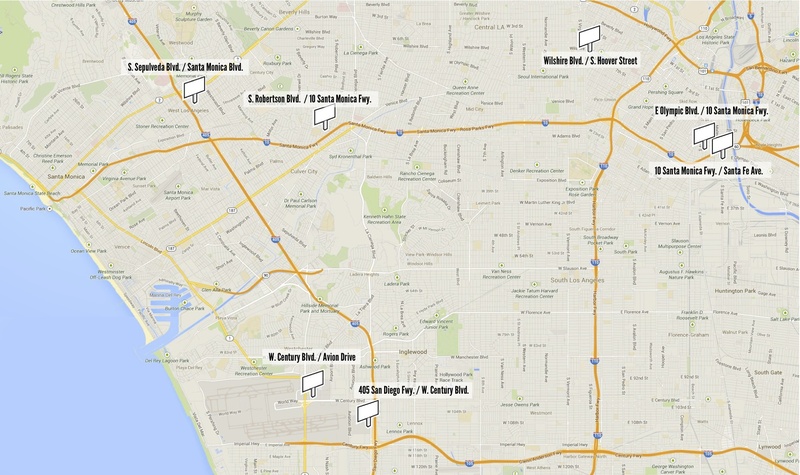 In an effort to highlight the population of Los Angeles workers who earn a ‘poverty’ salary, and to urge Angelenos to support living wage measures, the Los Angeles County Federation of Labor has paid for a month-long campaign of seven billboards (see map of where they are located, below) that mimic the sign that reminds drivers of a city’s population when leaving or entering its limits. But the figure on these boards is the number of people living on or below the poverty line. DnA spoke with Maria Elena Durazo, who heads the Los Angeles County Federation of Labor, about this campaign and why the group chose this method of marketing to convey their message. Caroline Chamberlain: What is the goal of your billboard campaign? 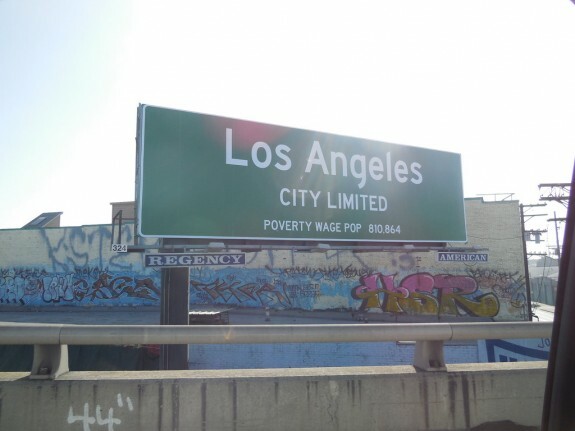 Maria Elena Durazo: The goal of the billboard campaign is to bring awareness throughout Los Angeles about the crisis of low wage work and the number of men and women who work full time and part time and who make poverty level wages. We think that the challenge, it should be a challenge to all of us, but I think the majority of people do not know that simple fact. CC: What do you consider a poverty wage? MED: We are using $15.00 an hour simply because that equates to about $26,000 if you work full time, and it’s a realistic number for someone to be able to make in the overwhelming number of industries. We think that at $15.00 an hour, calculated with the number 810,000 workers full time and part time that that not only would afford those workers some ability to be able to get the basics: like pay the rent, buy food, rely less on government assistance. It would also allow them to put a little bit into the pot for the greater good, like public education or the services we need day to day. So it allows them to not only raise their family with a little bit more money, but also they become contributing members of our community. CC: That 810,000 statistic, is it for L.A. County or L.A. proper only? MED: The 810,000 full time and part time men and women are in the city of Los Angeles only. 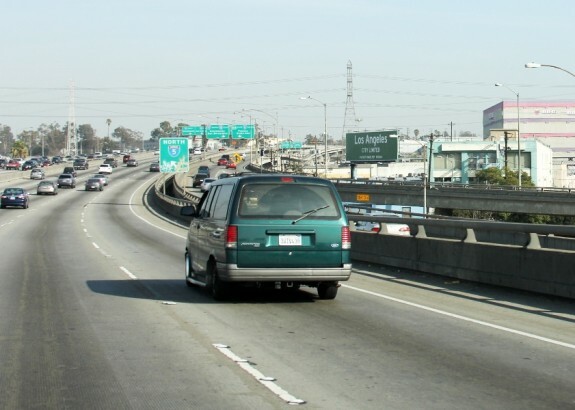 CC: Could we also talk about the design of these billboards– were these intended to look like freeway signs? MED: Obviously we wanted to get the attention of as many people as possible throughout the city, and we use a number of folks that help our staff and brainstorm as to how you can do that, and we felt that this particular design was simple, we didn’t want a lot of reading on it and that it goes to the basic fundamental point of the number of people who work hard every single day and live in poverty. CC: You chose a very subtle way to convey your message. The billboards don’t feature any images of poverty-stricken people, for example. Could you explain why you chose to go in that direction? MED: We want it to be factual, and sometimes an image of people or names, whatever, it might have a bias that would keep people from seeing the basic reality of the city of Los Angeles. We wanted to make it as simple, as direct, as strong as possible that would compel us, provoke us to do something about it. The message is strictly factual without any indication of what we should do about it, where we should go, who we should talk to. This is intended to let everybody use their own space in this community to do something about it and be free, rather than feel like they are connected to one group or another or you know of one inclination or another. CC: Is that why you chose not to include any union affiliation on the billboards? MED: We don’t want this fact to be seen as connected to anybody, it should be connected to all of us, whether you are a doctor, a politician, a civic leader, someone who makes a lot of money, someone who makes very little money, we all need to be concerned about this and do something about it, we could raise revenue for the city, we could raise revenue for the county of Los Angeles, and the state, we could have people being able to support their kids a little bit better than the average which is $9.55 an hour, that’s the average for those working full time from the 810,000. That is not what the city of L.A. needs to be a greater, better city. DnA: Did you select the sites of the billboards? 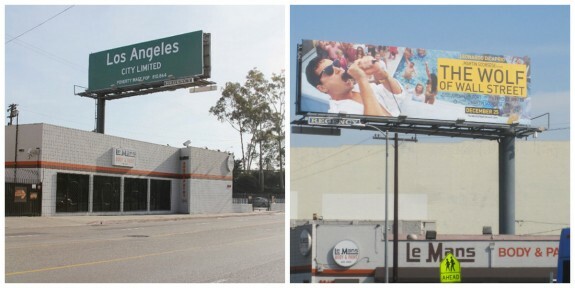 MED: We did not select the site of the billboards, it’s really difficult to get attention with so many billboards in Los Angeles. We just were hoping we could get the most awareness that the most number of people could see the billboards, regardless of the neighborhood. CC: We noticed that one of your billboards in Culver City–the one off the 10 freeway at Robertson Boulevard–shares a pylon with The Wolf of Wall Street (shown above). That’s a provocative juxtaposition. Was that intentional? MED: That was purely accidental, I wish we could say we were smart enough to identify that, but we did not make the decision as to where the billboards would be, or which neighborhoods we wanted them in, as much as we wanted it to get the attention it deserved. CC: Did you consider billboards versus social networking or TV ads? 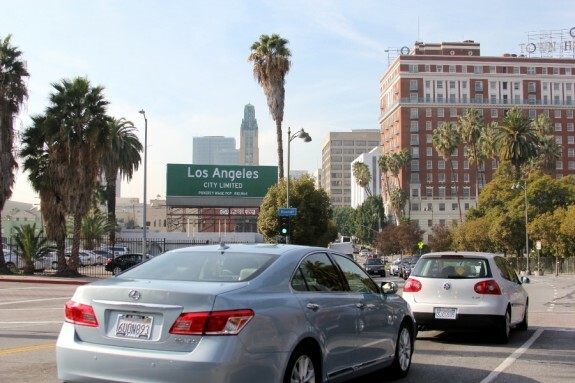 Or did you choose billboards as a traditional way to reach Angelenos? Is this part of a broader campaign using other platforms, or is this the one you’d think would be most effective? MED: Well we thought it would be the most effective as a different way of reaching as many people as possible. Obviously billboards do that. And our first goal was to reach as many people as possible. 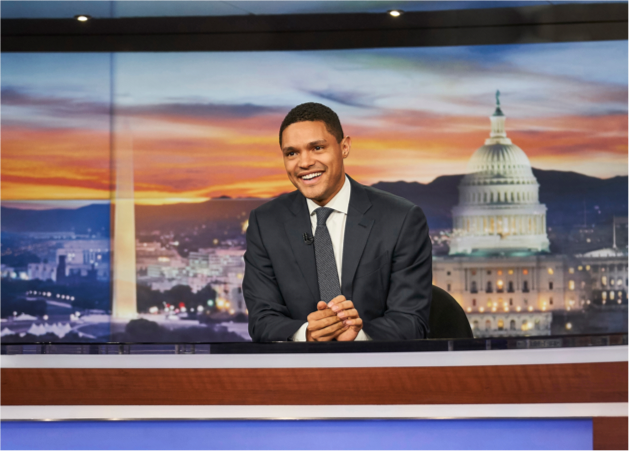 Obviously the second consideration is what cost that would be involved , you know the cost of television, the cost of radio, they cost a lot of money, and frankly we wanted to catch people’s attention and that’s why the simplicity of it, that’s why not a lot of visuals. Just one simple message. 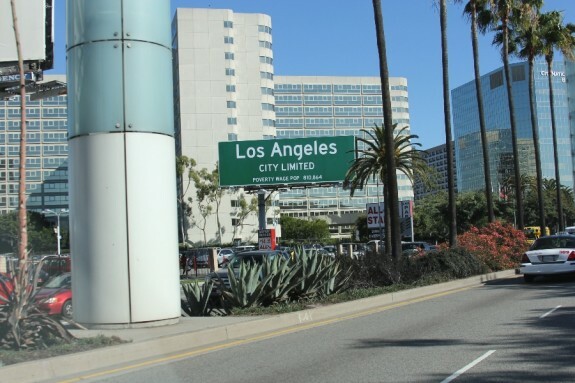 Billboards are part of the culture of Los Angeles and so we wanted to fit in with Los Angeles, but still let the message be simple and distinguishable and get a point across that hopefully gets people thinking about taking action, doing something about it, or incorporating it in their future plans. We are not naive enough to think that this billboard campaign by itself will reach as many people as should be reached, or will push as many elected officials as need to be pushed, but it’s certainly one element of raising this, getting attention on this issue. CC: Are you getting the reaction you were hoping for? MED: Well hopefully, and now we gotta get them to act and not just react. CC: Would a raise in the minimum wage apply to the public or private sector? MED: Well, look there are a number of campaigns, some of which have gotten a lot of attention, like the fast food workers, there are other campaigns like the poor truck drivers, there’s airport workers, there’s the hotel workers who are in the process of going to the city council and the mayor over increasing their minimum wage, there’s Walmart workers, retail workers, you name it, there’s a number of sectors of workers who are not waiting for something to happen, they are using that awareness to push for very specific actions to be enacted, not only by elected officials, but they are going to their employers as well in those industries, the real outcome that we want is action, to raise the standard of living, we should not decide in advance that any job is predestined to be poverty level and that be the end of it. All images courtesy of Los Angeles County Federation of Labor.